GENEVA, Switzerland, March 7, 2012 (ENS) – The Chevrolet Volt and Opel Ampera, General Motors’ two electric vehicles with extended range, were jointly named European Car of the Year at the Geneva International Motor Show’s first press day on Monday. The European Car of the Year award was established in 1964 and is presented by a jury of 59 automotive journalists from 23 European countries. This is the first year the prize has been presented at the Geneva Motor Show. The GM electric vehicles were selected over seven other finalists. Depending on the style of driving and road conditions, the Volt and the Ampera can cover distances of between 40 and 80 kilometers in the emissions-free, battery-operated mode. A 16 kWh lithium ion battery powers the 111kW/150 hp electric motor. The wheels are always powered electrically. In extended-range mode, which activates whenever the battery has reached its minimum state of charge, a gasoline engine drives a generator that supplies the electric drive unit. The range extender enables an operating radius of 500 kilometers (300 miles). The Volt and the Ampera have won many international awards including the “World Green Car of the Year 2011” and the “North American Car of the Year 2011” award. There have been accolades for safety such as the maximum 5-star Euro NCAP award. Ford CEO Alan Mulally and Ford of Europe Chairman and CEO Stephen Odell will unveil the all-new B-MAX at the Ford news conference March 6. Already shown at the World Mobile Congress in Barcelona in February, the B-MAX is powered by a range of engines, including the 1.0-litre EcoBoost petrol engine and a 1.6-litre TDCi diesel engine, both of which offer class-leading fuel economy and low CO2 emissions. Ford will showcase two new Focus models, which the company says “underline its commitment to a sustainable automotive future,” the Focus Electric and Focus 1.0-litre EcoBoost, featuring Ford’s most fuel-efficient petrol engine. When the Geneva Auto Show opens to the public on March 8, the Green Pavilion will showcase all kinds of new environmentally-friendly models and ideas from more than 20 exhibitors. World premiers slated for the Green Pavilion include the Vito E-CELL from Mercedes-Benz and the Z.O.E. from Renault. The Green Pavilion will feature the unveiling of the first electric vehicle by French hotel and restaurant designer Philippe Starck, the Volteis by Starck, which is still under a press embargo. Nissan will present its electric Leaf, the Car of the Year 2011. 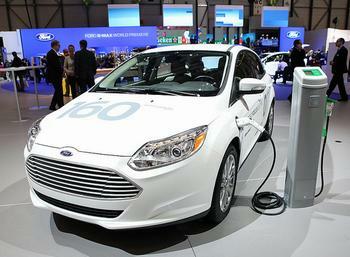 At Ford the Focus sub-90 will be shown, Toyota will have its Prius plug-in hybrid and Citroen’s C-Zero will be on view. A World Premier on two wheels  the E-Bike EF01 250  can be seen on the EH Line stand. A large stand at the centre of the Green Pavilion will be devoted to the Department of the Yvelines in France, whose three enterprises Lumeneo, Synerghetic, and AAA Industries will be presenting their advanced vehicles under the names of Neoma, Titler, and Moduleo. Under the label EVC, visitors will find the EVC-S5 (Skoda Roomster Elecktro) the futuristic motorcycle ZeroTracer, as well as new means of urban transport such as the Solo Wheel and the electric scooter from DXS – all of these fun electric two-wheelers will be available for test drives. Johnson Controls, the world’s largest producer of lithium-ion batteries, will present a world premier for this sector. Nokia, with an ecological navigation system and a hybrid street light installed in the Sarasin Park beside the bistro, will demonstrate how ecology can be applied to high technology and to infrastructure. 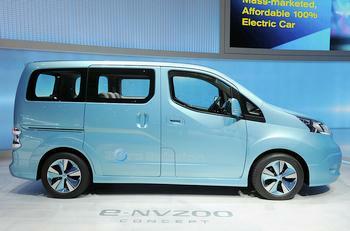 The latest electric vehicles and hybrids will be available for test drives. Next to the Green Pavilion, at least a dozen automakers will offer 19 vehicles for test drives either on a closed circuit or on the open road. The latest progress in hybrid technologies can be experienced at Toyota with their Prius Plug-in Hybrid and at Citroen with the DS5 Hybrid4. Among the test vehicles will be electric cars such as the Mitsubishi i-Miev and all of the electric models from Renault, which include the Fluence Z.E., the Kangoo Z.E., and the humorous Twizy. Visitors can test drive the C-Zero from Citroen, the Vito E-Cell from Mercedes-Benz, the Bluecar presented by Bollore, the Ford Transit Connect Electric powered by Johnson Controls and the Ford Focus Electric, as well as the Mia L from Mia Electric. Visitors curious to see how the Opel Ampera European Car of the Year handles can test drive one on the track next to the Green Pavilion. The Geneva International Motor Show is open to the public from March 8 through March 18 at the PALEXPO Exhibition Centre. Last year, more than 737,000 visitors attended.